As a kid your life is shaped by the academic cycle; the fuss of the new school start, rolling on to the stress of end-of-year exams and then falling into a pit of summer jobs and holidays. I feel like I only took a brief break from that cycle, mostly the years I was in Beirut, before finding myself caught up in it all over again. Spain, like France, makes even more of an ado about the vuelta al cole than the UK. Perhaps it’s because of the high proportion of people who opt for long studies. Maybe it’s because the 10-week summer break is so incredibly long that returning to school comes as a shock to the system. Or it could be because July and August are holy-months (holiday months, that is), sacrosanct vacation times for everyone even if they have no term restrictions, only a year-round office job. So now we are all finally back at school, having succumbed to the magnetic draw of the stationer’s and ticked almost all the items off the ridiculously long list at the stationer’s for my 6 year old. 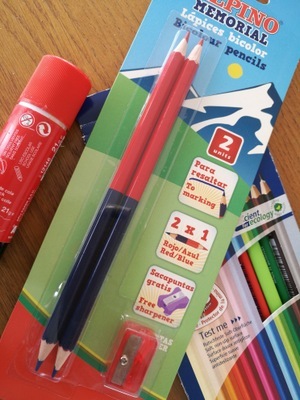 I even dutifully bought and labelled three double-ended red and blue crayons. What for I do not know. After all the list already stipulated a set of colouring pencils, one of wax crayons and one of felt tips. Each containing a red and a blue option. Surrounded by all those sharp new pencils and crisp folders, I nearly got overexcited and bought myself an italic pen for my budding interest in Arabic calligraphy. But then reflected on how investing in material for a hobby often sounds the death knell for said hobby, and resisted. Spanish, I told myself, pin down Spanish first. Urdu will still be there later. So I’m back at Spanish lessons and beginning to think about whether to strike out for the next DELE certificate, the C1. I passed the B2 with the Instituto Cervantes in May with a score of 85% (60% required for a pass) and need the motivation to keep improving rather than just jog along making the same mistakes. First of all though, a little review of the B2, because although I passed the level below last year (and got almost the same score! ), I found the B2 required much more technique. Marking: In the DELE tests, the four parts are split into two groups of two in terms of how they are marked. The reading and writing form one group and the listening and oral the other (though bear in mind the writing also includes a bit of listening, unlike the lower B1 level). You can get away with scoring a little less than the pass rate (60%) in one prueba if you compensate by scoring highly in its pair. Basically you need to score an overall minimum of 60% in each group to pass. Reading comprehension: I found this easiest in my preparation, so much less stress than the Oral and Listening, but in the real exam it felt like a particularly hard paper. I had always learnt to ignore exam instructions to ‘read the text then answer the questions’. I’m used to reading the questions and then looking for answers. But different tasks in this test require a different approach. It’s worth noting that unlike most exams I’ve ever taken, the five different tasks are not in order of increasing difficulty. 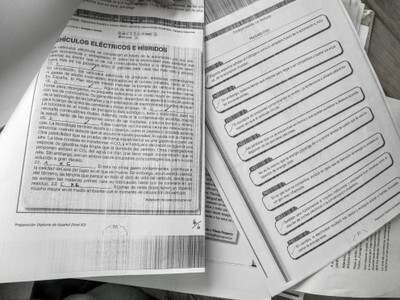 Practicing old papers will help you time the exam right. I found I needed to leave extra time for Tarea 3 that requires you fill in the gaps of a text with some excerpts (fragmentos). There are always more excerpts than you need, so some should be left out at the end. Although at times I got full points on this, the difficulty is that one error leads to more. I knew if I had had one fallo then I probably had three or four wrong. I tried to go back at the end to read it with a clear head, as the answers need to be chosen based not only grammar but also subtle issues with meaning. Obviously the excerpt shouldn’t contradict other parts of the text, but neither should it cover something that is covered elsewhere in the text. Sometimes it’s a fine line between a supporting argument (good!) and a repeating argument or slightly contrasting argument (bad!). The argument of the entire text has to flow well. 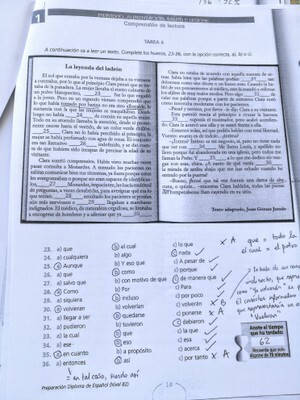 The final tarea, number 4, is a multiple-choice one-word fill-in-the-gaps affair which takes very little time. However it holds a lot of points (14 out of 36, or 39% of the whole reading prueba). So you need to have your prepositions and tenses down, as well as ser vs estar, por vs para and which expressions/ situations trigger the subjunctive. I got 94% in the reading comprehension, my best grade of the exam. The second task offers two options to choose from. Often one includes graphs. 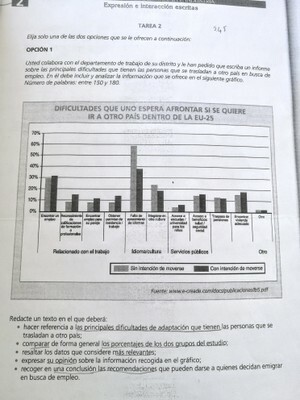 Although I felt more than capable of discussing pie charts or population graphs or the like, I found that when writing about the different elements, I was having to copy up the labels each time I referred to a specific column on the chart (eg: reconocimiento de calificaciones de formación o profesionales – phew) and it was not easy to think of synonymous labels for these that would still be accurate. I was afraid my text would not be understood, or that it would be too wordy, or that too much space would be taken up using the wording of the graph when in fact the candidate is supposed to be showing off language they have thought up. 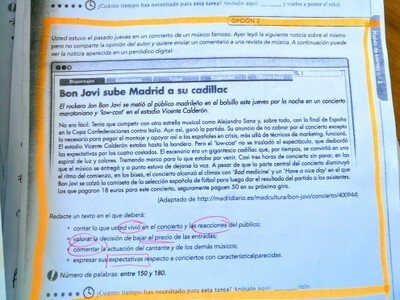 So in the exam I decided against the option with tables, although this means you are more likely to have to write about Bon Jovi’s cadillac or some other fiesta topic. According to the exam board, candidates are either nerds or partygoers! I was pleased to get 86% in this part, and I know I needed every bit of prep I did. My breakdown of the Listening and Oral exams will be up next.